"I need you to be the person you plan to be sooner." The first official trailer has arrived online for an indie romantic comedy titled You, Me and Him, from the UK made by Australian filmmaker Daisy Aitkens, her feature debut. 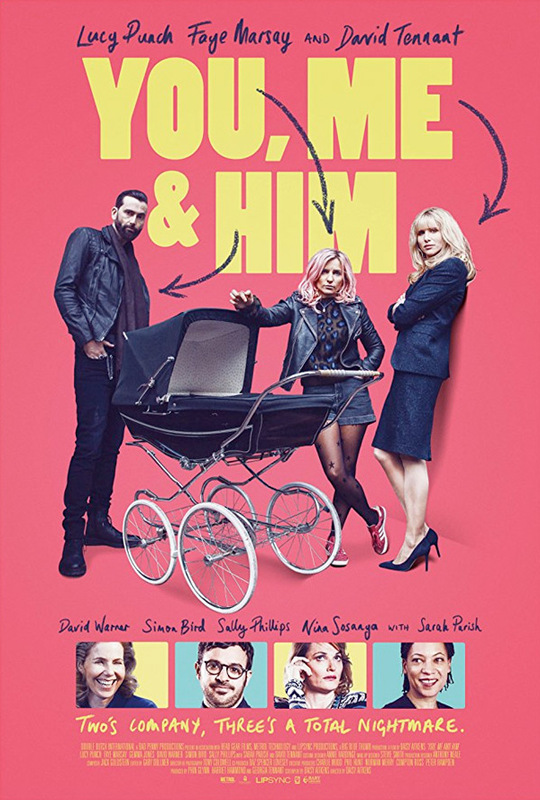 You, Me and Him plays with modern relationship dynamics by introducing a lesbian couple named Olivia and Alex, played by Lucy Punch and Faye Marsay. One lady is a career driven lawyer and the other a fun loving, pot smoking layabout and their neighbour is an annoying Casanova. While neither woman ever wanted children, both end up pregnant. How's that for a modern romantic comedy concept? The cast includes David Tennant, David Warner, Sarah Parish, Peter Davison, Gemma Jones, and Sally Phillips. From the footage in this trailer, it seems this is trying too hard to be a quirky comedy that captures society's romance, but lacks any of the nuance or real emotions of the real world. But I don't know. In this classic romantic comedy with a very modern twist, we meet lesbian couple Olivia and Alex (Lucy Punch and Faye Marsay). Despite their age difference, they're very much in love. As the question of pregnancy beckons and they befriend their new neighbour John (David Tennant), lines begin to get blurred and the trio find themselves in some truly uncharted territory. You, Me and Him is both written and directed by Australian actress/writer-turned-filmmaker Daisy Aitkens, making her feature directorial debut after a few short films previously. This hasn't premiered at any film festivals or otherwise yet. Aitkens' You, Me and Him will open in UK cinemas starting April 2018, but doesn't have an official US date set yet.